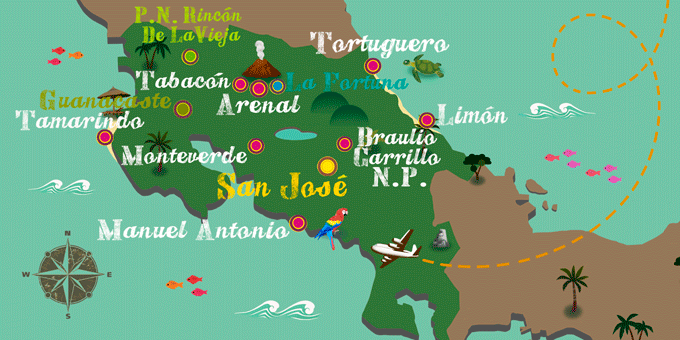 Costa Rica is a Central American country, situated on a thin isthmus and bordered by Nicaragua to the north and Panama to the south. It is a country known for untamed rainforests, tropical wildlife, and colorful Caribbean culture; images of idyllic beaches, lined with lush palms and colorful flora spring to mind just at the mention of its name. In fact, Costa Rica translates to ‘Rich Coast’, owing to the finery worn by the native population when the country was first discovered by Spanish explorers. Today, this meaning could easily be attributed to the vibrant coastline of the country, which runs along both the Pacific Ocean and the Caribbean Sea. It has been an increasingly popular destination for nature travel since the 1980s and today it is a world-pioneer of eco-tourism, as, despite its popularity, the abundant natural beauty of the environment has not been compromised, with businesses doing their best to choose sustainable options to accommodate visitors. Costa Rica has even been named the ‘greenest country in the world’. Combining lush rainforests, idyllic beaches and a cheerful atmosphere, a holiday to Costa Rica is a nature-lovers paradise. Most tours of Costa Rica begin in the vibrant capital of San Jose, with a historic downtown district awash with colonial architecture, before moving on to the fantastic natural wonders of the country such as the Arenal Volcano, abundant Manuel Antonio National Park, the cloud forests of Monteverde, for zip-lining adventures, and the precious beaches and jungles of Tortuguero. Having completely eradicated deforestation in the country, visitors on a holiday to Costa Rica can enjoy a number of protected national parks, each which their own unique nature and attractions. Corcovado National Park is renowned for its biodiversity, considered to be one of the most biodiverse regions in the world. It has a variety of hiking trails, both along the coast and inland, taking visitors from tropical beaches into swampland, rainforests, and mangroves. Its wildlife includes scarlet macaws, tapirs, jaguars and an amazing 4 species of monkeys. The national park of Tortuguero is famed for its nesting turtles, most notably the endangered green turtle species, who nest on the beaches at specific times throughout the year. This spectacle is a popular attraction for tourists who have the opportunity to watch quietly from a distance. Monteverde National Park is another of the popular nature reserves in Costa Rica, with a rich biodiversity of around 400 bird species and 100 mammals.